Watch out Asus, ViewSonic is gunning for you. An excellent gaming display that doesn't skimp on image quality for the sake of refresh rate. Thanks to the aggressive prices of the latest UHD TVs, the value proposition of any given PC monitor is pretty parlous. Take the new ViewSonic XG2703-GS. 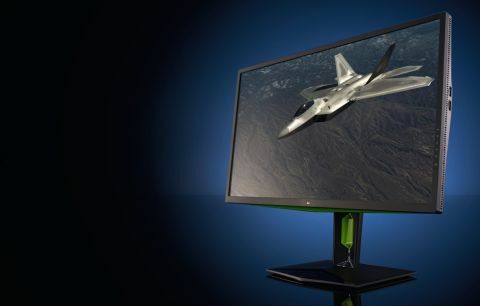 For around $700, you get a paltry 27 inches of LCD panel, and a mere 2560x1440 pixels. In UHD TV land, the astonishing reality is that $250 will buy you 40 inches and the full 4K complement of 3840x2160 pixels. That’s nigh on one third the money for roughly twice the screen, by the major metrics. Of course, UHD TVs are not directly comparable with PC monitors. What’s more, ViewSonic’s latest looks pretty clever next to what is arguably its nemesis, the Asus ROG Swift PG279Q. Both monitors check an awful lot of the same boxes. We’re talking 27-inch, WQHD resolution, IPS panel technology, 165Hz refresh capability, and support for Nvidia’s G-Sync adaptive frame synching tech. And yet the new XG2703-GS comes in at a full $100 cheaper than its Asus competition. Nice. Indeed, ViewSonic has done a very nice job all round with its latest gaming panel. Straight out the box, it’s immediately obvious just what a nicely calibrated monitor this is. The colors really pop, without being over-saturated, and both the black and white scales are pretty much pitch perfect. This thing has balance. As you’d expect for an IPS panel, the viewing angles are super. More of a surprise, perhaps, are the subjectively deep and inky black tones. Contrast performance is above the IPS norm. We really like the smooth, clean anti-glare coating, too. There’s hardly a whiff of that nasty grain and sparkle that blighted those IPS monitors of yore. Likewise, support for up to 165Hz refresh just sweetens the deal, as does the lack of perceptible input lag, and G-Sync doing its buttery smooth thing in games. Add that to those rockin’ colors, the clean panel coating, the top-notch viewing angles, and the super-smooth rendering, and you have a near faultless package. The chassis is also a nice break from the ViewSonic norm, and comes complete with some slick plastics and green accents that hint at the Nvidia G-Sync technology inside. The stand is fully adjustable, to boot, including rotation into portrait mode. If you were determined to find fault, a little banding is visible in gradients, and the black levels can’t quite compete with the very best VA panels. Likewise, the 165Hz refresh setting is buried under a very silly “overclocking” heading in the on-screen menu, which is annoying more than actually debilitating in any way. And the Asus Swift is superficially a bit snazzier as a piece of consumer electronics. That aside, there’s virtually nothing in it. With all that in mind, we’re struggling to come up with compelling reasons to pay the extra $100 for the Asus. But still that UHD TV comparison is hard to shake. Indeed, there are some 40-inch 4K PC monitors, albeit somewhat UHD TV derived, that come in well under the price of this panel. Heck, there are middle-budget smartphones that can match its pixel count. Part of the problem is no doubt the inclusion of G-Sync. It requires a proprietary module inside the monitor that adds at least $100 to the eventual retail price. The high refresh capability and the quality IPS panel all add to the cost, too. All of these are industry-wide issues, not things specific to this monitor, of course. But as nice a screen as this ViewSonic is, $700 still feels like one hell of a lot for a 27-inch PC monitor with mere WQHD resolution. Hopefully, the market as a whole will realize this sooner rather than later, and the price of this kind of high- performance 27-incher will come down a little. It needs to.